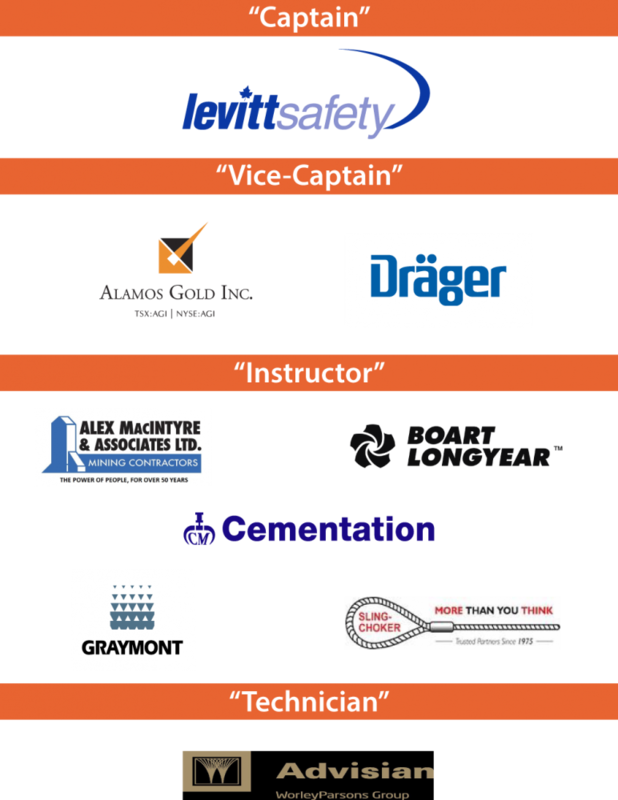 2018 Manitoba Provincial Mine Rescue Competition Champions announced | Mining Association of Manitoba Inc.
Congratulations to Team Snow Lake members Captain Bob Forsyth, #2 Riley Eastman, #3 Brandon Cook, #4 Jenni Oleksuk, Vice-Captain Jordan Galloway, Director of Operations Brian Shapka, Technician Bernard Fourie, Coach Terry Hornyak and Instructor Dallas Henrikson were presented their trophies on Saturday, May 26, 2018 at the Awards Banquet. Team Vale finished at a close second place. Other Awards presented were the Firefighting award won by Vale, First Aid award won by Vale and the Written Exam award won by Tanco. The Technician's award went to Rob Chuipka, Technician for the Vale team. This award is given to the technician who demonstrates the highest level of proficiency in preparing the BG 4 breathing apparatus for use in emergency situations. "I want you to know that I watched every team and every team member compete today. You all should be very proud of what you did, I am. Though you all made different decisions, I want you to know that as a person that works in mining, if I was in trouble in the mine I would be thankful and comfortable knowing that you guys were coming for me. No matter which team it was. You are the best of the best with a unique skill set for responding to the industry. The mining industry thanks you and is very proud of you." This two-day annual event challenges competitors in several areas. Day one saw teams from Hudbay Flin Flon, Hudbay Snow Lake, Tanco and Vale compete in an underground and first aid mine rescue mission and tackle a written exam. The morning of day two focused on firefighting tests and the Technician's competition, the afternoon was spent on practical skills competitions of a Toyota Pull, Tire Lift, Stretcher Relay and a Bike Build. The winners of the provincial competition are eligible to compete in the bi-annual National Western Region Mine Rescue Competition which takes place in Fernie, BC in September 2019. The 2019 Manitoba Provincial Mine Rescue Competition will be hosted by Hudbay Flin Flon on May 24-25 in Flin Flon, Manitoba.